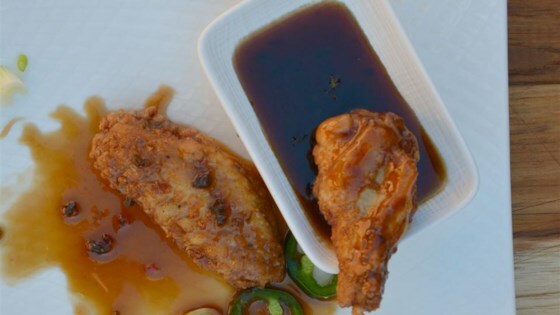 "A great alternative to teriyaki wings - with a kick!" Combine brown sugar, jalapeno pepper, soy sauce, lime juice, honey, rice vinegar, red wine vinegar, sesame oil, fish sauce, and red pepper flakes in a saucepan; bring to a boil. Reduce heat and simmer until slightly reduced, 15 to 20 minutes. The best wing sauce my husband and I have ever had!!! !